Here's a strange one !! This card was postmarked in the 50's. But some strange stuff is going on here !! There is a sign for the "Castles Baths 50 cents",but the Castles burned down in the 30's ! and 50 cents in the 30's was alot of money ! 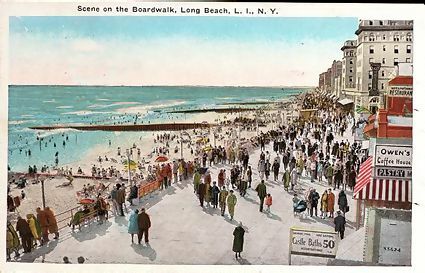 Also, the boardwalk deck is wrong for the 50's..granted the postmark really means nothing as the card could have been in circulation for years but look at the people on the boardwalk.. they are wearing winter coats yet people are swimming in the ocean !! I think the artist took a few liberties with this one and combined several decades into one postcard ! 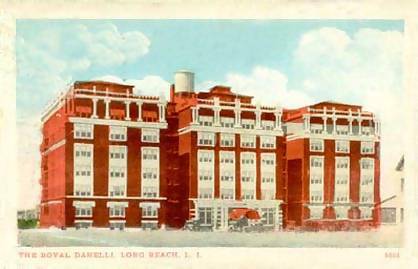 The Royal Danelli is located at 65 Lincoln Blvd between Broadway & Shore Road on the west side of Lincoln Blvd. It is still standing and fully occupied. Built prior to 1929. This card circa 1940. This is Villa Modestina, captioned the Italian Gardens, sure looks pretty !! 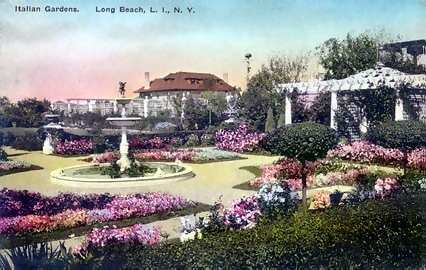 A mini estate built on 20 lots at Laurelton and Penn by Dr Fanoni in the early 1900's days of Reynold's strict architectural guidelines. 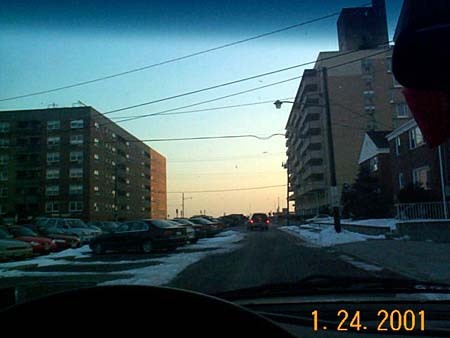 Looking down Neptune Blvd from Broadway. A nice shot of the Pink Palace !! 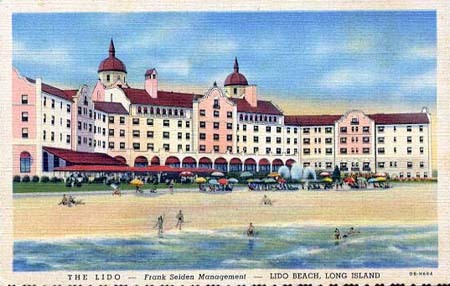 The Lido Hotel in 1942. 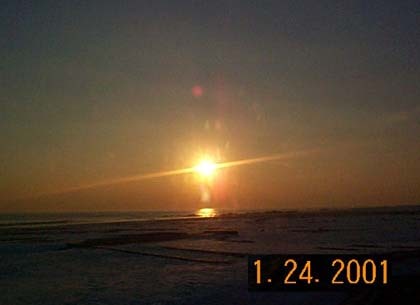 The Ocean Crest (formerly Scharf Manor among other names !) 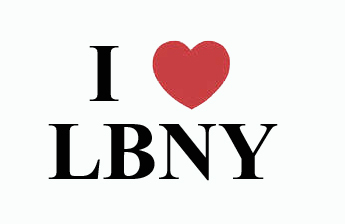 sits on Laurelton Blvd and the boardwalk. Still standing and now called Hoffman Manor. This view probably in the 40's. 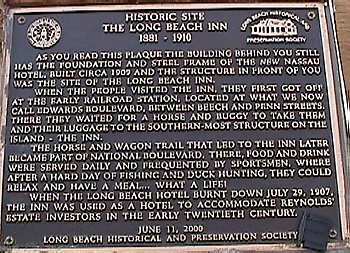 The historical marker on the right sits on National Blvd near the boardwalk.. 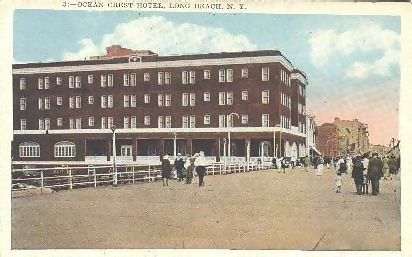 It describes the Hotel Nassau's frame and foundation used in the building on the west side of the boardwalk ramp.. at one time the Long Beach Inn, pictured above left and below left, sat on the east side of what became National Blvd. and is described also. 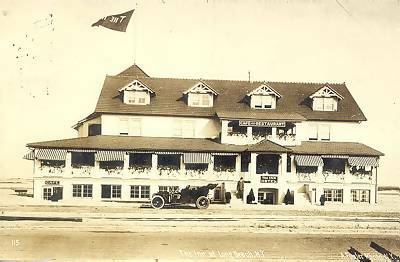 I'm not sure what became of it, but most likely it either burned, or was bought up and demolished after the Hotel Nassau was opened in 1909, as tennis courts and the music pavillion were here late in 1910 or 1911. 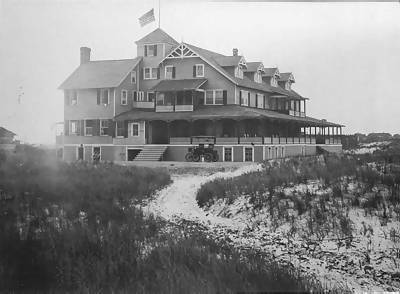 The photo above was taken in 1905 and shows nothing but sand around the Inn.. 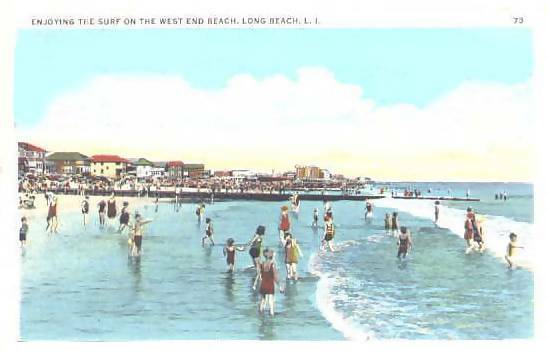 The buildings faintly visible in the distance are probably part of the Long Beach Hotel complex. The one below was taken in 1910 and shows a bit better road in front. 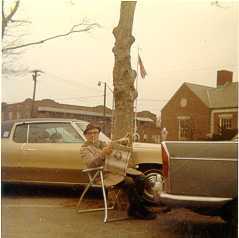 Thanks to Vinny Rossi for the historical marker photo. 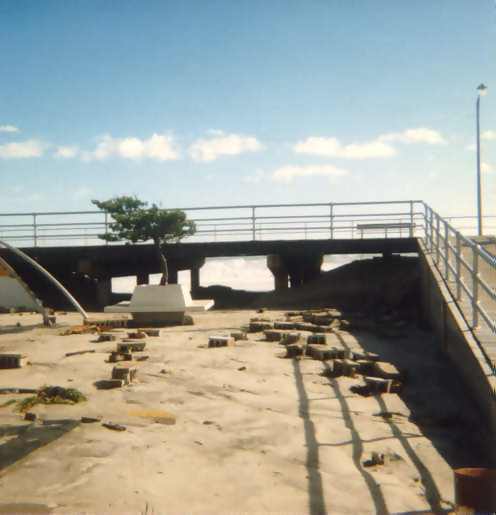 Magnolia Blvd Boardwalk & the beach after Hurricane Gloria in 1985. Those are cinder blocks strewn around !! 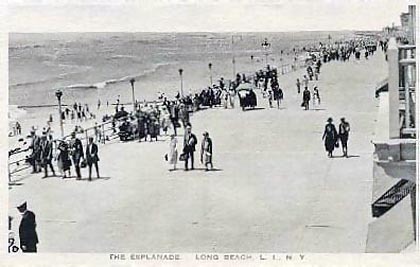 An early postcard showing the West End. Appears to be somewhere west of Virginia Ave.
A nice, early card showing the President Hotel, which burned down in August 1965. 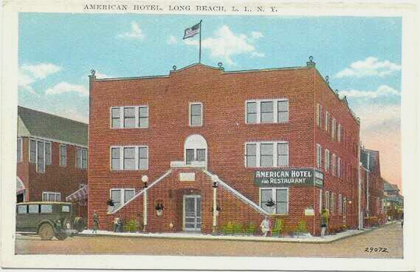 The American Hotel and Restaurant. Later called the Americana and now condos. The old Arizona bar is partly visible to it's left. 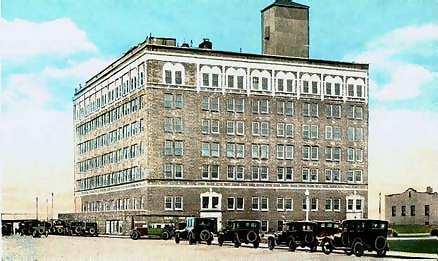 This building still stands today at the SW corner of Arizona and Oceanview. 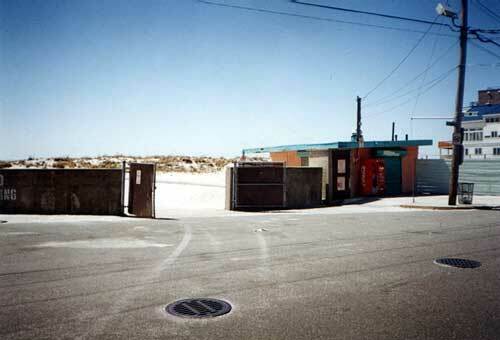 The entrance to Pacific Beach in May 2001. 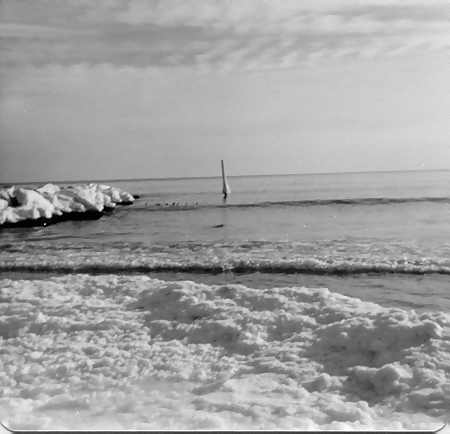 Early 1900's Page Bob Foster's Old Photos ! !